The Hario V60 Range Server (VCS-02B) holds up 700ml of coffee graduated in both 100 ml and cup size increments, with one cup equalling about 130ml. This is a companion carafe for use with Hario 2 cup filter cones. This server is made of heatproof glass and is fitted with a solid, quality plastic handle and neck. The removable plastic lid fits snuggly and has a comb design for trapping any residual grinds while pouring. This particular server is one of Hario's most economical. Many companies and inviduals use V60 servers as a container of freshly brewed drip coffee. 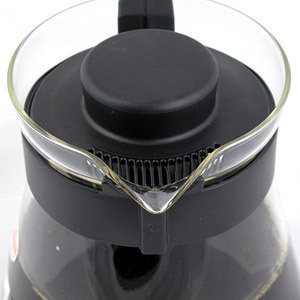 Hario filter cones can be placed directly atop the range server, which in turn, provides easy pouring of brewed coffee. This is some of the highest quality glass being manufactured. The word Hario means 'King of glass' in Japanese. Holds 700 ml, roughly 23.5 ounces.